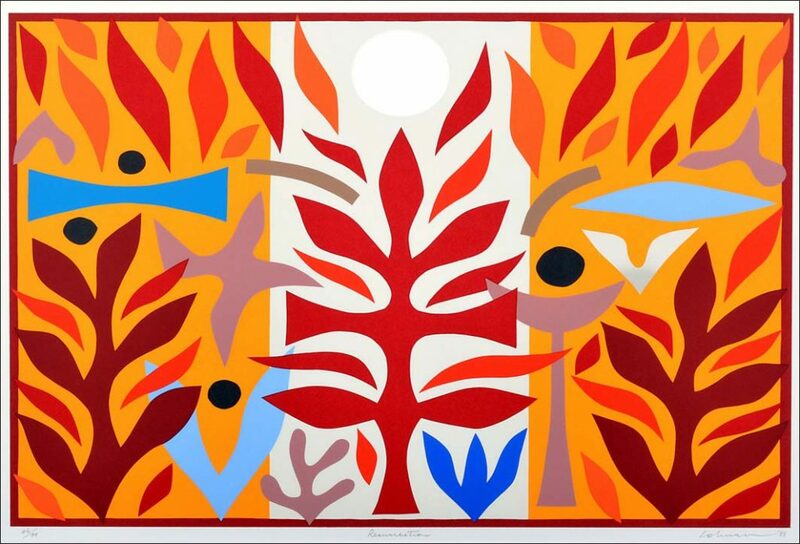 John Coburn 9 archival silk screen fine art prints titled Summer, Autumn, Winter, Spring, Paradise Garden, Tree of Life 1988, Death and Transfiguration 1988, Resurrection, and Hozanna, the edition folio set was limited to 99. John Coburn was born in Ingham, Queensland, Australia on 23 September 1925. John moved from town to town with his mother and two younger sisters as his bank manager father went from branch to branch. His father died when the boy was 10. While enlisted in the Royal Australian Navy during World War II he travelled around the Pacific and Indian oceans as a radio operator, drawing images from these places whilst aboard HMAS Nepal, including Sri Lanka, Papua New Guinea and others. It’s a flat-patterned style of painting, using brilliant colour combinations based on natural or organic images. He won the Blake Prize for Religious Art twice, in 1960 and again in 1977 (shared with Rodney Milgate). In 1996 he won the Mandorla Art Award. All the major galleries in Australia have collected and displayed his works as well as many major private and corporate collections, such as the Cbus Collection of Australian Art. For several years, two of his tapestries were hung in the Sydney Opera House, as curtains in the Drama Theatre and the (recently renamed) Joan Sutherland Theatre. Seven hang in the John F. Kennedy Center for the Performing Arts, Washington D.C. His works are also displayed in the Vatican Museum, Rome.